Ronda Goldfein and Jose Benitez stand in Prevention Point’s drop-in center. The pair approached former mayor Ed Rendell to ask for his help championing a safe injection site. Outside the Bellevue Hotel on an August afternoon, Jose Benitez and Ronda Goldfein were preparing for the hard sell. For months, they had been working quietly on perhaps the boldest undertaking of their long careers at the front lines of Philadelphia's worst public health crisis. Now came their most audacious pitch yet: to turn around the city's astonishing opioid death rate by opening a site where people in addiction could use drugs in the presence of medical staff, be revived if they overdose, and then be connected to treatment, housing, and other services that could turn around lives and communities blighted by drugs. Now, Benitez, who runs Prevention Point, the city's only needle exchange, and Goldfein, the director of the AIDS Law Project of Pennsylvania, were on their way to present Ed Rendell with their proposal. Rendell, as a former mayor and former governor, could lend them legitimacy — someone prominent enough to win over some opponents, and maybe even give pause to federal authorities threatening legal action to shut down the safe injection site. But they had also selected him because, more than three decades ago, he had championed a harm-reduction effort that, at the time, was just as controversial: Prevention Point itself. They got into Rendell's office, but he stopped them almost as soon as they got started. "He was like, 'I already know what this is,' " Goldfein said last week, laughing. He signed the documents to incorporate the Safehouse effort on the spot. Rendell's reaction — spurred in part by the overdose death of a close friend's son — was a welcome surprise. But it's typical of the conviction driving the safe injection effort, that saving people from overdosing is less a radical idea than a commonsense proposition — even if it means allowing illegal drug use to come out of the shadows. Sharing that sentiment are those on the advisory board of Safehouse, including a Roman Catholic nun who is a tireless advocate for the city's homeless; the city's top health officials; a public health school dean; and the head of a major health system. Safehouse faces considerable hurdles: Legal threats from the federal government, civil or criminal. Daunting fundraising goals. Finding a location. Public opposition. The burden of potentially being the first such site in the country to open — and potentially fail. But on that day in August, Benitez and Goldfein savored that one easy win with Rendell. "I walked out of his office thinking, This is real," Benitez said. Looking back, they should have predicted Rendell's enthusiasm for a safe injection site, Goldfein and Benitez said. After all, Rendell, as mayor, had taken a similar stance when Prevention Point launched in 1992 amid the AIDS crisis: He signed an executive order legalizing the needle exchange, despite a state law banning it, and told authorities they could come to City Hall and arrest him first. Now, he's joking about the tennis games he'll play in federal prison if he gets locked up over the safe injection site. After city officials announced in January they would allow a safe injection site to open — as long as it happened with private dollars — Benitez seriously considered adding that effort to his portfolio, despite the risks. And he knew they were considerable. On Benitez's first day at Prevention Point in 2005, protesters tried to tip over a van handing out clean needles on Tusculum Street in Kensington, now the epicenter of the city's opioid crisis. Protecting the needle exchange, its staffers, and the 15,000 people in addiction it serves was paramount. 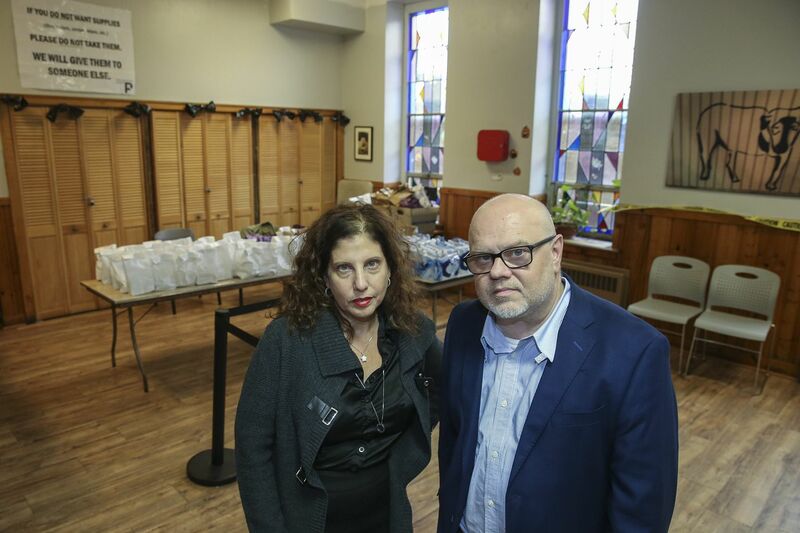 "Early on, we realized we had to create a [separate] nonprofit," said Goldfein, who is married to David Lee Preston, an Inquirer and Daily News editor. "We would never want to do anything that put Prevention Point at risk." Benitez, normally a sound sleeper, admits to spending more than a few nights wide awake in recent months. Benitez and Goldfein went to law firms around the city looking for help creating their first-of-its-kind nonprofit. "We got turned down by a lot of cowardly big law firms," Goldfein said, and eventually landed at Cheshire Law Group, which specializes in nonprofit coordination. Even before they brought Rendell on board, they sought to create an informal advisory board stocked with heavy hitters. Health Commissioner Thomas Farley and David Jones, the commissioner of the Department of Behavioral Health and Intellectual disAbility Services, signed on. In keeping with the city's hands-off approach, both men distanced themselves from the site's operations, but said in an email Friday that overdose prevention is part of the city's overall strategy, and so they would advise the group on medical protocols and paths to treatment the site could provide. Next on the list was Sister Mary Scullion, the president and executive director of Project HOME, the city's preeminent housing, poverty, and homelessness services organization. Plus, having a woman of her position on board has to help the project's image. "Who doesn't love a nun?" Benitez said. Benitez had already been warned by lawyers he could face 20 years in prison for opening the site, and shared that with Scullion. "Sister Mary was like, yeah, I'll go to jail with you guys," he said, laughing. Scullion said in an interview she hoped it never came to that. But if a safe injection site can get people into recovery, that outweighs "any kind of fear" about legal ramifications, she said. Farley connected Safehouse officials with Larry Kaiser, CEO and president of the Temple University Health System; and Ana V. Diez Roux, dean of Drexel University's Dornsife School of Public Health. Both Kaiser and Roux, Goldfein said, readily signed on. Deputy Attorney General Rod Rosenstein has vowed to pursue legal action against a safe injection site in Philadelphia. But, in some ways, the political situation in Philadelphia makes it a prime location for a site, Goldfein said. There's Prevention Point, which has decades of harm-reduction experience. A progressive district attorney, Larry Krasner, who supports the idea. Mayor Kenney, who is keeping mostly silent in public but encouraged Rendell, the former governor wrote in a letter to the Inquirer on Friday. "If not here," Goldfein asked, "then where?" The volume of overdose deaths reminds Goldfein of her early days at the AIDS Law Project, when she had to warn new employees that most of their clients were going to die. It would be years before they went a week without losing a client to the disease. That's what Benitez tells Prevention Point staffers now. It's a typical scene there for one outreach worker to be sobbing in his office over one death, while, outside, colleagues are reviving another overdose case. Sometimes, even after his staff secure an apartment for a client, they still relapse and overdose. "I have to tell our staff that at least we did all right by them: They didn't die on the street," he said. Even after facing such dire pressures, both Benitez and Goldfein feel the stakes in their latest project are even higher. "If we are indeed first" in the nation to open a site, "and if this doesn't run right, we screw it up for the rest of the country," Benitez said. "That is an enormous pressure — we want to do this right, for the community." Public, political, and legal opposition aside, fundraising remains an obstacle. So far, they have raised just $200,000 for planning purposes. It will take about $1.8 million to launch and operate the site in its first year, and about $800,000 a year after that. Finding a place for the site and hiring and training staff loom large too. But formally announcing Safehouse's creation Tuesday has given the nonprofit a new sense of momentum, said Benitez. "That night, I had the best night's sleep I had in months," he said.